Having power-hungry father is one thing, but having a father who doesn’t think twice about unleashing his dark magic across the entire Nexus? That’s something most of us can’t relate to as kids. But Orphea knows all too well the negative influence her father, The Raven Lord, has had over the Nexus. In a blind drive to protect it from an invading force, he asserted his power over the other lords and conquered their realms. Distraught over how evil her husband became, Orphea’s mother left the family, abandoning a young Orphea in the process. As she grew older, her love and affection for her father faded and she eventually came to see as a monster. Now it’s her mission to stop her father from completely taking over the Nexus. 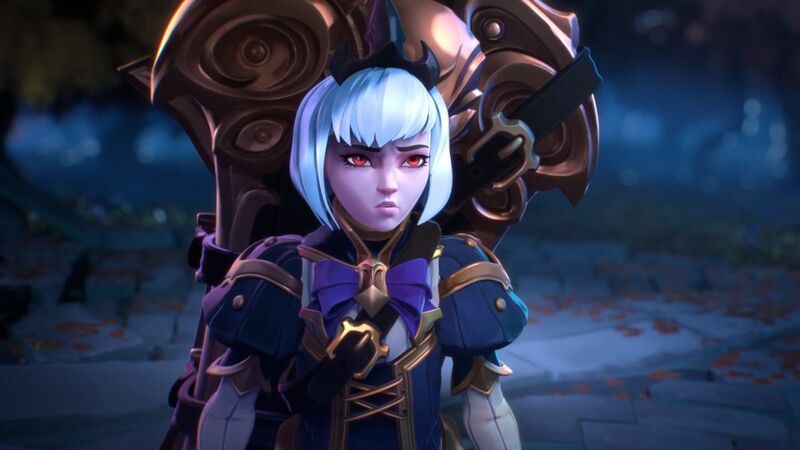 Announced during BlizzCon opening ceremonies, Orphea is the newest addition to Heroes of the Storm, and the first hero to come from the Nexus—something that the team has wanted to do for a long time. She only just appeared in the new Heroes of the Storm comics, but the devs have been working on her for much longer. Introducing her in the comics was a subtle way to get the community familiar with her name and her backstory before formally introducing her into the game. “We’ve established the story through not only the battlegrounds and the characters, but the comics too, which is linking everything together,” said game designer Kyle Dates. “With the comic, we didn’t just want to be like, BlizzCon! Surprise! Here’s a hero you never heard of. The comics were our way of building up to this event, introducing her slowly, and getting people used to the idea that maybe there might be something there.” Their approach not only worked, but the reception she received at the opening ceremony was one of awe and excitement. Ophrea was instantly loved, that much was clear. In addition to her traumatic and sordid family history, Orphea is a scary, downright lethal assassin. “By the time the first comic came out, we already had a playable character in the game and were testing her abilities,” said Dates. With her powers fueled by the family relic she carries on her back, her attacks not only deal massive amounts of damage, but in the right hands she is a nightmare for enemy melee heroes. With Shadow Waltz, Orphea can slap down her sharp-fanged sidekick on her enemies at a distance. (Illidan, you have met your match.) Chomp combined with her Backbite talent deals double the damage as Shadow Waltz and pushes her back a short distance, allowing Orphea an easy escape from combat while taking the last literal bite. She has some minor crowd control abilities with her heroic abilities. Eternal Feast deals damage in a area and will keep dealing damage as long as an emery hero is hit each time. Crushing Jaws, my personal favorite, pulls enemies toward the center while simultaneously stunning and damaging them. There is no learning or skill barrier to playing Orphea, and that’s exactly how she was designed. “One of our goals when we were working on Orphea was that she was approachable [… ] We didn’t want our first Nexus hero to be only playable by one percent of the population,” said Dates. However, she’s at a disadvantage when facing off against ranged heroes. Heroes like Sylvanas and Tychus have longer ranged attacks than Orphea’s abilities, and she is a little more susceptible to those attacks compared to other similar heroes. Her strengths and weaknesses came about naturally. “For Orphea, it kind of naturally turned out that she was a little bit stronger against melee and that she was a little bit weaker against ranged. All of her abilities force her to stand still, which means skill shots hit her easier […] She’s really got to get in there and be in the middle of things.” Bachynski added more about Orphea’s strengths and weaknesses by saying, “Making sure we had that counterplay was a really strong goal of ours, but making sure she’s not so easily stomped by ranged assassins, I think her Dread ability ends up being really powerful, because it has a super long range and it’s giving her trait stacks. I use it a lot as area denial.” Orphea does have a specific Dread build that helps counter potentially hostile interactions with enemy ranged assassins, but it involves a lot of predicting where the enemy hero will move. While Orphea is easy to pick up, facing off against other ranged heroes will provide a nice challenge to players with a higher skill level. I haven’t played Heroes of the Storm since Sylvanas’ balance update in April, but not only has Orphera renewed my desire to play again, I can also see her being one of my mains. You can play Orphea on the PTS this week, and she will officially roll out later this month.